This is just heavenly for both babies and bigger kids! Sleepy Head Bath Wash doubles as a bath wash & shampoo. What a great way to prepare kids for a restful night’s sleep. Simply add to running bath water when filling the bath. Rub in hands & apply to wet hair. Rinse thoroughly. Confusing, isn’t it? There are times when ‘fragrance’ or ‘parfum’ on a label is OK and other times that it is not OK when it represents something synthetic and nasty! In our product ‘parfum’ is a vegetable based natural preservative and not a synthetic one. You cannot have an Australian Certified Organic Product and use synthetic ingredients. 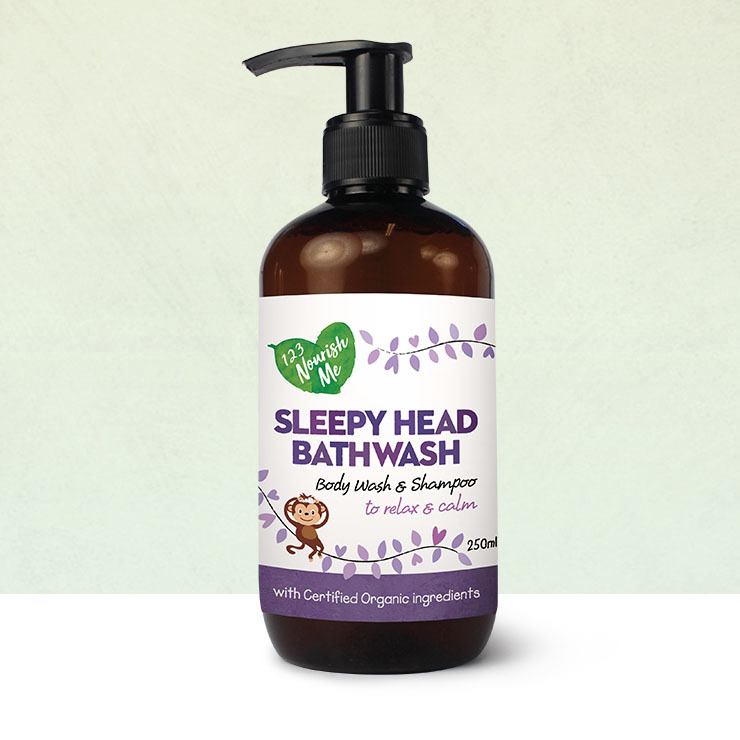 Our Sleepy Head Bath Wash has passed the Australian Certified Organic Certification Process. We can’t wait to hear what you think of our beautiful new Sleepy Head Bath Wash! Wonderful smelling product & love all the natural ingredients! Using the body wash is a wonderful way of starting our night time routine. We both love it! The sleepy time bath wash is just perfect for my Bub. She loves it and makes for a good start to the end of our day ! Just love this. First time buying it and I live the smell and the fact it has no hidden nasties. Thumbs up from me. i love this! smells super good and my daughter loves it so much! We love the sleepy head bath wash. After trying so many different products, we have finally found one that doesn’t dry out our kids skin. Thank you 123 nourish me for giving us the peace of mind that our kids are using a safe and wonderful product! This makes bathtime smell amazing and cleans my boys perfectly after playing outside in the samd and dirt. Smells amazing and have now stolen off our 15 month old daughter to use in our shower, we are ready to order another one! It definitely fit in great to our sleepy bath time routine with essential oils in the bath, calming music in the background and lights dimmed for her and this was definitely the missing puzzle piece! Leaves a great scent afterwards on her skin too! Stellar product here, heavenly scent and perfect consistency. Love the pump pack too! Love it!!! The smell is great, the bottle looks great and it leaves my little one fresh and clean. 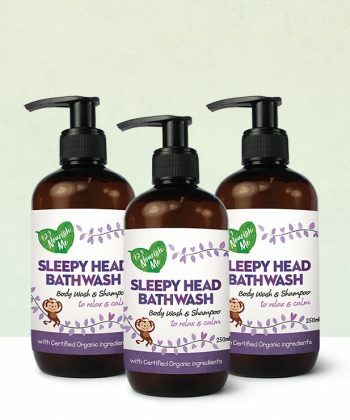 We have just started using the sleepy head wash in the bath this week and first time as a shampoo last night! My boys love the smell and it is great on their sensitive skin. My eldest really doesn’t love getting his hair washed, but we used this ‘magic shampoo’ and it made the process a whole lot easier. PLUS it made his hair smell amazing!! Thank you for a great product . I bought the sleepy head balm and wash for a gift – it arrived quickly and so beautifully presented. I have had great feedback that my niece is sleeping better and mum seems more relaxed too – double bonus. I also got the Calm Down roll-on for myself and my boys, I’ve tried a few different ones, but this one is definitely my favourite. It has the sweetest aroma and works a treat – my boys love it too. Thanks for chillin’ us all out! I love this bath wash my 18 month old son who is always hyperactive at night time and since using this amazing product it’s made a huge difference he’s so much more relaxed before bed time. It also smells amazing!!! Loving the sleepy head bath wash! It smells amazing and makes the kids hair so shiny without the worry of any nasty ingredients. Thank you 123 nourish me! Have been using this body wash on my 13 month old the past few weeks and love it! It smells beautiful and love that it’s free of any nasties. I even ended up buying more so I can use it on my sensitive skin! Love this! Very gentle and smells amazing! Wish it came in a bigger bottle! Love this stuff!! Love how it’s totally safe for the kiddies to bathe in and love the smell!! Beautiful product – love it. Leaves skin and hair clean and smelling. Bit of pampering for the kids! Love bathing my son at night with this before bedtime. It smells amazing and is exactly what he needs before bed. Beautiful product and i feel good that there are no nasties in it. Love this bath wash!! Great smelling, feels nice on the kids skin. Used it in the boys hair as well and left their hair nice and soft. Love it!!! I am 100% in love with this! It smells absolutely amazing and even better My daughter is sleeping like a dream! This bath wash is a pleasure for bub and for me. Not only does it smell divine, it really seems to make a difference to bub’s sleep. We didn’t use it for a couple of nights (hubby in charge) and wowsers they were they rough nights. Started using it again and he started sleeping like an angel again. That’s enough proof for me! The bath wash is fantastic, I have 2 children who are sensitive to just about every wash and shampoo but this product is great, my kids love it and it smells wonderful. Thankyou!! Love knowing my little missy is not getting covered in chemicals. Love the Magic Bath Wash and so do my girls. Its so much gentler on their skin and smells devine. Absolutely gorgeous magical stuff. We love bath time in our house. Its a very important part of our bedtime routine and we looooove the amazing smell of this bath wash.. the best part is.. no nasties. Love knowing I’m helping them sleep even if they don’t. Smells great, lathers and cleans well. Wish it came in a bigger size. THIS STUFF IS MAGICAL! My son has coarse hair, like REALLY coarse hair. I just thought that’s how it is and always will be. But since using this shampoo, it is soooooo soft. I can’t stop petting his hair!!! It’s comforting to know if my baby drinks the bath water accidentally that he’s not ingesting tons of chemicals. It does suds up nicely. But it doesn’t produce tons of bubbles if you pour it in the bath water like other bubble products. I purchased this for my son who is 2.5yrs old. For most of his short life he’s just been washed with water & a cloth as his skin is very sensitive. I decided to give the magic bath wash a try & there have been no nasty flares up requiring steroid cream to clear it up. It smells really nice too. This shampoo and wash smells so amazing! It doesn’t burn or irritate my sons eyes or skin:) I love that I can now use organic skincare that I know has none of the nasty chemicals that other grocery bought so called organic skincare has! 5 stars. My 2 year old son loves your magic bath wash. It must be magic because he allows me to wash his hair using it! Actually, he prefers to do it himself. I find the scent really relaxing for before bedtime and I feel good knowing there are no harsh chemicals in there. Wow!! This bath wash is amazing. It bubbles and smells devine. Best of all it calms both my kids for bed. I haven’t tried it yet but love the scent. It’s such a relief to finally find a product for my kids that I can rely on, knowing there’s no yucky ingredients! Seriously in love with this product and so are my kids! I have been using this on myself as a face wash in the shower, and my face has never looked so healthy. I have always had trouble with acne and oily but dry skin. I was trying to work out the other day why it was looking better than ever and much less red and blotchy and then I realised it is the magic bath wash! I love knowing that the stuff that is on my babies’ bare skin isn’t full of nasties. They LOVE bubble baths and even my hands feel smoother after they’ve been in there! The only downside is that it doesn’t feel like the bottle lasts very long! Any chance of higher concentrate?! Thanks for a gorgeous product. Kids love this product. Bath time super easy now ! My daughter loves this shampoo! If I could have an endless supply of this bath wash I’d be one very happy Mummy! 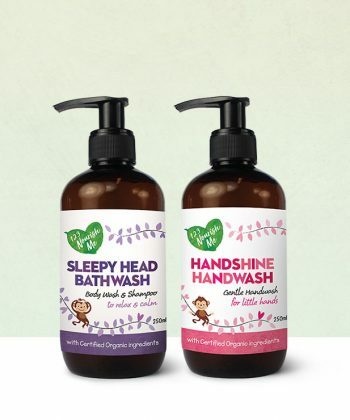 It smells amazing, has no nasties and exactly what I have been searching for – we’ve used it 2 nights in a row and unlike other bath wash/soaps it hasn’t dried out or irritated my little one’s skin. Extra bonus is that their hair is so fluffy and smooth having also used it as a Shampoo. It has also helped to calm and relax our energetic 2yr old that much so, that they happily jump into bed earlier and with the help of the trusty Sleepy Head Balm he is counting sheep within half an hour. We use the magic bath wash every night along with the sleepy head balm and they are both worth the money. My girls would fight sleep until 1-2am now with these products I have them in bed asleep by 8.30pm every night, without a fight. All natural product that I know won’t harm my sons skin he loves it his skin loves it. I’m challenged with computers, but ordering was really easy, and my friend received the order in less than a week. The precious little one the bath wash is for hasn’t arrived yet, but her mum is really happy her little girl will be having the kindest , safest products on her skin. From a family who has allergies and sensitive skin, thank you for another great product!!! I think I’m going to have to purchase everything in your range. Amazing! Finally something that is not only natural but is also amazing to use! Best part of my daughters bath and shower routine! Thanks so much! Very satisfied customer! Its been good on my 4 month olds sensitive skin. Im happy with it. Such a lovely, silky, smooth and amazing smelling bath wash!! It is also a wonderful shampoo that has left my hair feeling so nice and soft for much longer than any other shampoo I’ve ever used! The first night my 5 year old son used it I asked if it was any good and his answer was “Yeah mate, good as”! That is definitely a win in my book and this will be the only brand of bath wash I will be buying from now on. So thank you so much for another great product that doesn’t contain any nasties that we can happily use knowing it is not harming us at all!! Received my parcel today, and can’t wait to use it. Purchased 3 bottles, one for each of my daughters, and one to have at Nanny’s house. Loved it, arrived Quickly, used it straight away in kids bath, its not too soapy or strong smelling. I have 1 child with sensitive skin and he went really well with it. Cant wait to try more products. I’ve been looking for a body wash/ bubble bath for my 3 boys for a while now and I’m so happy I found this! Smells amazing and I feel great knowing it has no nasties in it! I’ll be buying again and gifts for my friends with little ones too! This bath wash smells amazing!! The fragrance lasts overnight on Mr 4 year olds skin and he loves it!! It took no time at all to arrive and it is safe enough for me to use on Mr 4 month old! We will be ordering many more times, Thank you for making an amazing product that is safe for the whole family!! !